Wanna learn how to make sindhi biryani? The recipe is here by KFoods.com. Let's add mint, sprinkle chillies and coriander with other spices and prepare a delicious Sindhi chicken biryani. I term it queen of biryani recipes. What do you do? 1. For Rice: In a cooking pot heat oil and add cloves, black cardamom (broken), bay leaves, cinnamon, stir fry. 2. Now add water (equal to the amount of rice), black cumin, black pepper and boil. 3. When it boils, add rice to it and simmer medium flame till water dries. 4. For Korma: Heat oil in a saucepan, and fry onion till brown. 5. Then add tomato, plum and all spices. 6. Stir fry and add chicken and cook for 15 minutes. 7. At the end add yogurt and further cook for 2-3 minutes. 8. Now take half of cooked rice in a separate dish, and spread the cooked qorma over it. 9. Lay green seasoning (mint, coriander and green chillies) on it, spread the remaining cooked Rice and again lay green seasoning on top. 10. Cover and simmer on light flame for 15 minutes or until done. Sindhi biryani is an extraordinary recipe from Sindhi cuisine. It didn't only got fame within the country but also came in limelight internationally. It's special cooking method and out of the ordinary spices make it a natural choice of food lovers. Though, some restaurants offer Sindi biryani or near to this but as many restaurants do not mention the exact recipe name, eaters remain unaware about the fact that they are eating the famous Pakistani biryani. However, with the recipe given by KFoods.com, you can enjoy it at home, whenever you like. Sindhi Biryani is the one of the most eaten biryanis of Pakistan. It was introduced from Sindh province of Pakistan and now it is available throughout the country. The thing unique in the recipe is the combination of special Sindhi spices. yogurt, tomatoes, chili powder, green chilies, coriander, cardamom, cloves, cinnamon, bay leaves, dry plums and ginger garlic, taste of all these spices is permeated up in rice and finally a very spicy biryani comes into being. There is a big list of Sindhi cuisine recipes out of which Sindhi fish curry, Sindhi chicken biryani, Sindhi chicken curry, Sindhi besan curry and Sindhi koki recipes are the high-class ones. Among different specialties of the land of Sindh, its foods also make it prominent in the country. 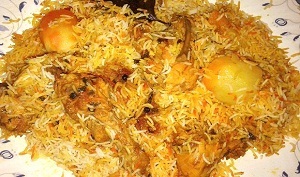 Enjoy recipe of Sindhi biryani and have an exclusive biryani meal today. biryani koi si bhi ho mujhe boht pasand hai lekin aj kal mera pait kharab hua wa hai is liye biryani or deegar heavy khanay nahi kha sakta . khichdi hi kha sakte hain abhi usi ki recipe search kar raha hun jo thori taste me bhi munasib ho. har sheher or ilake ki koi na koi khas dish zaror hoti hai or sindh ki sab se mazaidar khane ki cheez sindhi biryani hai . mujhy ye biryani kha ke andaza hua keh ye kitni mazedar hoti hai is ki recipe me jo cheezain istamal hui hain un ka jawab nahi . tabhi to aesa taste ata hai lajawab! Hey, can anyone tell me the recipe of sindh biryani by chef rida aftab? i am looking for it but can't find . pls tell me or as a second option, i can follow the recipe by chef gulzar. pls send it here I would come back and keep checking this post. hum ne bhi sindhi biryani ki boht taref suni hai or hum ne biryani bus sadi wali hi banai hai ghar pe . is ki recipe hum ne kfoods pe check ki to humen ye wali recipe boht achi lagi . chef shai ki hai to umed hai boht tasty hogi . hum ne ye choose karli hai or aj raat ke liye hum yehi banaye ge.